What makes this studio unique is the teaching that goes on within. Client needs are always the priority, whether it’s schedule flexibility or attention to exercise modification, the client is why we’re here. It is the goal to make the client comfortable and confident in what is happening in every session. It is not just what you do in a Pilates session that is important, but how you do it. The structure of any workout is important but it’s more important that you, the client, experience and understand the goals of the workout. Everyone comes with their own needs: it’s our goal that everyone leaves feeling and looking better every time! Pilates can benefit everyone. Athletic people come to improve their performance in many different endeavors: golf, tennis, running, softball, dance, skating, and channel surfing. 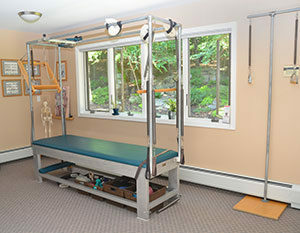 Some clients have come to essential movement® to improve their daily life with “issues” such as: knee pain, shoulder pain, neck pain, scoliosis, sciatica, herniated discs, post surgical recovery, pregnancy, joint replacement, breast cancer recovery, MS, and PD to name a few. You are welcome to try any of our offerings, Privates, Duets or Mat Classes, to experience the personal and unique atmosphere of essential movement®.